A short night paddle around Coochie had left the day free and sounded like a great the way to wet the boats again. Not reading the blurb (can be a good idea) left us embarrassingly unprepared to contribute gourmet finger food so we took a bonza bun instead. 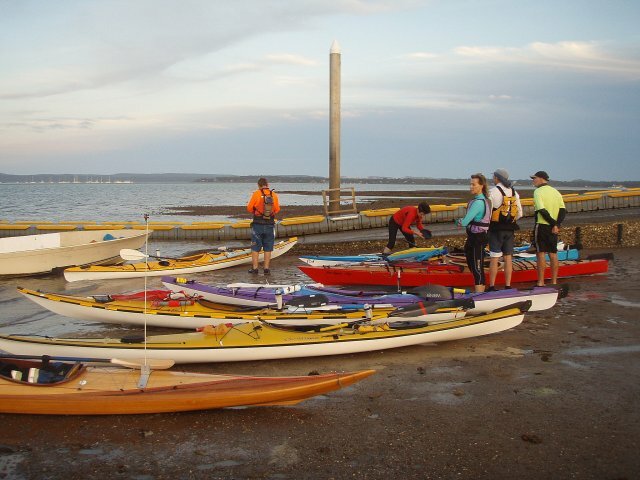 Kayaks gathered on the muddy sand near the bottom of the tide to the north of the Victoria Point boat ramp. A steady NE was blowing across a turning tide as the group started to head counterclockwise around the island. However, this did not hold much interest for Mark nor I as we thought it meant a short stint before dinner. We did an about face and headed north and in doing so picked up a tail. Carol wondered if she had missed something as the direction she was paddling in changed without discussion. Fluid decisions like this bring a UHF radio into their own as they keep people in the loop. Trundling up the island into a warm slop we scuttled alongside the reef looking for the marker. By now it was getting dark and our trail zig zagged as we picked our way along by paddle strike whilst homing in on the yellow flashing beacon at the end of the reef. Here we bobbed around holding position waiting for the tail to wind in. It was dark and with moon rise a couple of hours way it was inky. A steady small chop washed over the boat and it was like being rocked erractically in a wet hammock. Even had we read the blurb, we certainly had no intention of landing on the northern beach as the tide was still very low and those beaches have rocks a plenty. 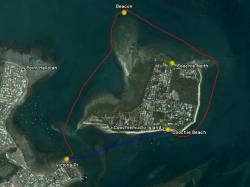 I was wondering about how far the NE reef stretched offshore. This this rocky little beauty had gouged large scrolls of plastic off both platypus and was heralded by small breaking waves in a paddle depth of water. It made for warm face slaps and nervous moments for possible boat strike. Again UHF radios may have been helpful with the front of the mob passing back directions although I think most people would have kept their hands on their paddles and just followed the dancing lights ahead. The radios would have been invaluable had there been a man overboard in such dark conditions. Rounding the eastern side bought a quiet following swell. Something large in deeper water rose up and bumped the bottom of Mark's kayak. Certainly wasn't mineral and thankfully did not return for identification purposes. Fish splashed around in the shallows as we rounded the SE corner and headed in for land. Sheltered from the NE the southern beach was blissfully calm although we had to head in close to the jetty for a sandy landing. A beautiful spread of home made finger food graced the table next to which we placed the ungracious dumper of a cream and raspberry bun. The tidbits were exquisite. Even dumper was divvyed up. 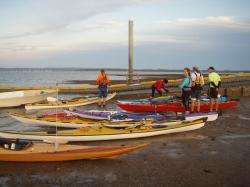 Ted kindly shepherded the boats up the beach with the rising tide. With everyone satiated on a variety of delicacies we headed back for Victoria Point. For a moment there it looked like we were going to have a welcoming committee as several cars spun donuts in the car park. At times there could be advantages to arriving on location enmasse wearing body padding and holding a paddle. While the UHF are excellent for communication, they need to be held securely in a water proof bag so that the buttons are accessible in a predictable location at all times. They also need to work. While there were times when the signal was broken, this is not always the case. If you are bollocking your paddling partner, the others might just be maintaining discrete radio silence.